Reputation is everything in the business world. With our current climate of online research and reviews, your business reputation means more now than ever before. Studies show that consumers read at least 10 reviews for a company before they are willing to give them their business. Additionally, 67% of consumers are swayed one way or the other based on online reviews. Read on for the top tips to build and maintain a positive business reputation. The simplest way to have a successful business is to be a problem solver. The world is full of problems and people who don’t know how to solve them on their own. Make your business excel at solving a particular problem and then direct all of your energy into advertising toward the people who need you. For example, a lot of people know that online entrepreneurship is hot right now. Can your business build websites or instruct people how to us SEO? Speaking of websites, having a blog on yours can go a long way toward consumers viewing you as an authority in your field. Additionally, your website will be interactive and chock full of good information. Finally, as you post consistently onto your blog, your website will have stronger SEO, leading to more customers. Social media for businesses these days are a must. Regardless of how you feel about Facebook or Instagram, your business needs to be on them. More specifically, you need to be active on social media. But don’t over-sell your business. If you do nothing but try to sell people on your social media account, you will lose all of your followers. Post things specific to your business, but without trying to make a sale. You should post 80% non-sales content and 20% sales content. Keep in mind, people like authenticity and can generally tell if you’re being fake. Be genuine, kind and authentic. Show people what you can do for them and what makes you and your business different from all the others. Part of being genuine includes taking your customers’ advice and feedback to heart. This doesn’t mean living and dying based on every review. It simply means paying attention. If someone complains about your hours, it’s not a personal attack against you. Additionally, if those hours are hard for one person, they’re likely not alone. People will tell you what they want, all you have to do is listen. Through your social media or store, be bold, ask customers for reviews! At this point, consumers are pretty used to this and won’t mind. Furthermore, you won’t get what you don’t ask for. If you want to add incentive, run a raffle that offers a special discount or prize for everyone that gives you a Google review. Finally, to win over your customers and potential customers, be quick on the draw when responding to comments, questions, and reviews. Make sure they know they are important. More importantly, make sure they know their patronage and their reviews are appreciated. 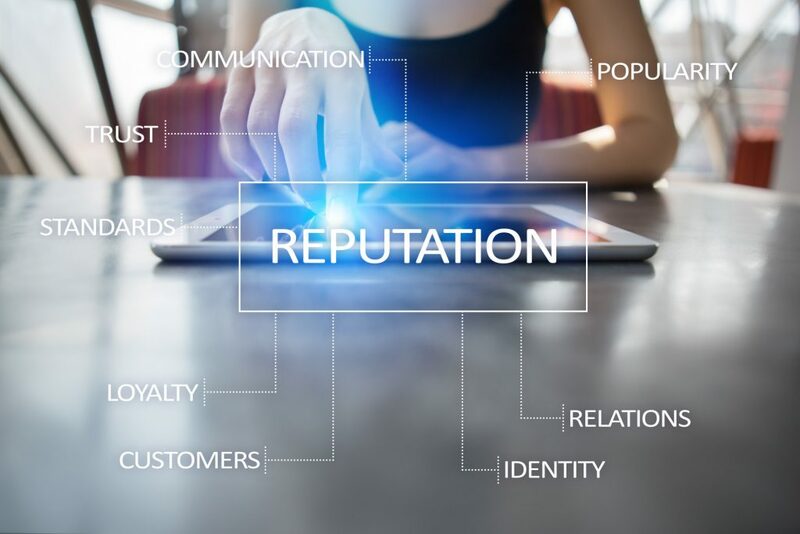 While it may be tedious at times, maintaining your business reputation is absolutely vital. When it comes to running a successful business, consistency is king. Don’t build your reputation to the sky just to watch it fall to the ground. For more advice on marketing and business, check out our blog! Also, did you know we give free marketing consults?